Def Leppard guitarist Phil Collen has spoken about the upcoming Poison tour in the second part of his interview with Full Contact Fighter magazine. You can watch part two of the video interview below featuring Phil talking about the tour as well as MANRAZE and fitness. 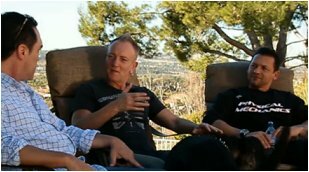 Phil picks up the Def Leppard tour talk where he left off in the last video (see previous news link). The tour was recently confirmed by both Poison drummer Rikki Rockett and Rick Allen. "There's a movie coming out, Rock Of Ages, which is based on the Broadway play Rock Of Ages which is also the title of one of our songs, that's how it all came about." "Tom Cruise is the lead in the movie, and he ends up singing 'Pour Some Sugar On Me'. We actually went down and watched him film, We was in Florida and he was out there. We've got three songs in the movie, I know Poison have got two songs as well. So it makes sense that we all get out and do this kind of Rock Of Ages tour if you like for the summer." "So we're looking forward to that and it would be good if - we just started when we got out last time (2009). Just talking about - Jean went over some kicking techniques for Rikki. And it'd be nice to kind of roll it all into one thing when we get out next time."